1. Company should be authorized by Articles of Association to Buy Back its own share. Special Resolution If Buy Back is up to 25% of the total paid-up capital and free Reserves. 5. Time Gap between two buy back should be one year. c) if any default, is made by the company, in the repayment of deposits accepted either before or after the commencement of this Act, interest payment thereon, redemption of debentures or preference shares or payment of dividend to any shareholder, or repayment of any term loan or interest payable thereon to any financial institution or banking company: However, the buy-back is not prohibited, if the default is remedied and a period of three years has lapsed after such default ceased to subsist. d) No company shall, directly or indirectly, purchase its own shares or other specified securities in case such company has not complied with the provisions of sections 92 Annual Return, 123 (Declaration of Dividend), 127 (punishment for failure to distribute dividend) and section 129 (Financial Statement). 8. If Special Resolution is to be passed, Notice for the same has to be given to Shareholders at least 21 days before the date on which passing Special Resolution. 10. Form MGT-14 should be filed with the Registrar along with fee within 30 days of passing the Special Resolution. 11. After the Special Resolution but before the buy-back of shares, company should file with the Registrar of Companies a letter of offer in Form No. SH-8, along with the fee & that needs to be signed by 2 directors, at least one should be Managing director, if any. 12. File with the Registrar and the Securities and Exchange Board (in case of listed companies), a declaration of solvency in Form SH-9, along with the letter of offer and fees which that needs to be signed by 2 directors, at least one should be Managing director. in such form as may be prescribed and verified by an affidavit as specified in said form. 13. Letter of offer needs to be dispatched to the Shareholders or security holders within 20 days from its filing with Registrar of Companies. 15. 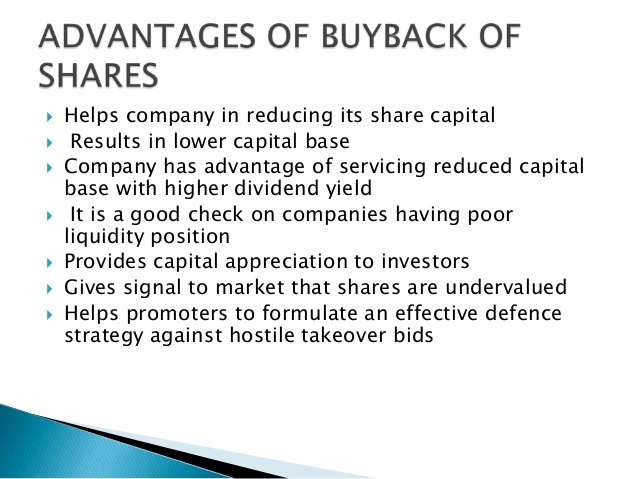 If buy back by the company is over subscribed then the total number of the shares to be bought back, the acceptance per shareholder shall be on proportionate basis out of the total shares offered for being bought back. 16. The company should complete the verifications of the offers received within 15 days from the date of closure of the offer and the shares or other securities lodged shall be deemed to be accepted unless a communication of rejection is made within 21 days from the date of closure of the offer. 17. The company shall immediately after the date of closure of the offer, open a separate bank account and deposit therein, the total amount payable as consideration for the shares offered for buy back. 19. Where the company buy backs its own shares and other securities, it shall extinguish and physically destroy the shares and securities so bought back within 7 days of the last day of completion of buy back. 21. The company, shall maintain a register of shares or other securities which have been bought-back in Form No. SH.10. This register shall be maintained at registered office of the company, at the custody of the secretary of the company or any other person authorized by the board in this behalf & entries in this register shall also be made by the secretary of the company or any other person authorized by the board in this behalf. 22. A company should after the completion of the buy-back file with the Registrar and the Securities and Exchange Board (in case of listed companies) a return Form No. SH.11 along with the ‘fee’ containing such particulars relating to the buy-back within thirty days of such completion, as may be prescribed. There shall be annexed to the return filed with the Registrar in Form No. SH-11, a certificate in Form No. SH- 15 signed by two directors of the company including the managing director, if any, certifying that the buy-back of securities has been made in compliance with the provisions of the Act and rules. 23. Penal Provisions: If a company makes any default in complying with the provisions of buy back or any regulation made by the Securities and Exchange Board, (in case of listed companies), the company shall be punishable with fine which shall not be less than one lakh rupees but which may extend to three lakh rupees and every officer of the company who is in default shall be punishable with imprisonment for a term which may extend to three years or with fine which shall not be less than one lakh rupees but which may extend to three lakh rupees, or with both. 24. Section 115QA of the Income Tax Act applies to buy back of unlisted companies shares (equity & preference). Company has to pay distribution tax @ 20% on the amount of distributed income (consideration paid by the company for the purchase of its own unlisted shares LESS sum received at the time of issue of shares), within 14 days from payment of consideration to shareholders, which will be exempt in the hands of shareholders u/s 10(34A). One should not forget to consider the Interest and penal provisions u/s 115QB & 115 QC. For Companies Listed on recognised stock exchange, Section 46A will apply i.e. Capital gains provisions are applicable & no distribution tax is payable by the company. 9. The aggregate shareholding of the promoters and of the directors of the promoter, where the promoter is a company and of the directors and key managerial personnel as on the date of the notice convening the general meeting. 10. The aggregate number of equity shares purchased or sold by persons mentioned in point no. 11, during a period of twelve months preceding the date of the board meeting at which the buy-back was approved and from that date till the date of notice convening the general meeting. 13. A confirmation that there are no defaults subsisting in repayment of deposits, interest payment thereon, redemption of debentures or payment of interest thereon or redemption of preference shares or payment of dividend due to any shareholder, or repayment of any term loans or interest payable thereon to any financial institution or banking company. iv. the Board of directors have formed the opinion as specified in point 14 on reasonable grounds and that the company, having regard to its state of affairs, shall not be rendered insolvent within a period of one year from that date. 6. The company shall not utilize the proceeds of an earlier issue of the same kind of shares or same kind of other specified securities for the buy-back. When a company purchases its own shares out of free reserves or securities premium account, a sum equal to the nominal value of the shares so purchased shall be transferred to the capital redemption reserve account and details of such transfer shall be disclosed in the balance sheet. The capital redemption reserve account may be applied by the company, in paying up unissued shares of the company to be issued to members of the company as fully paid bonus shares. Whether the company is authorised to buy back its shares or securities by Articles of Association (AOA)? If No, alteration of AOA is to be initiated or not? (AOA has to be amended by passing a Special resolution) File MGT-9 within 30 days. 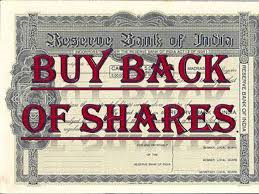 Have you determined the quantum of buy back of shares? What is the quantum of the shares to be bought back? If the buy back is less than 10% of paid up equity share capital & free reserve, then Board resolution will suffice, therefore is the Board resolution passed for the same purpose? Whether have you checked that Number of shares to be bought back in respect of Equity shares should not exceed 25% of its total paid up equity share capital? Whether the restriction related to buy back u/s 70 are checked? No buy back will be permitted if the buyback falls under the clause of Section 70? 3. if any default, is made by the company, in the repayment of deposits accepted either before or after the commencement of this Act, interest payment thereon, redemption of debentures or preference shares or payment of dividend to any shareholder, or repayment of any term loan or interest payable thereon to any financial institution or banking company: However, the buy-back is not prohibited, if the default is remedied and a period of three years has lapsed after such default ceased to subsist. Whether there is a gap of more than one year from the closure of previous buy back? If special resolution is to be passed, whether the notice of the same is given at least 21 days prior to the date of passing the Special Resolution? Along with Notice, Explanatory Statement also needs to be provided to Shareholders? Whether have you checked that explanatory statement contains all the required information as per SEBI regulations (for listed companies) and Companies (Share Capital and Debenture) Rules 2014 (for unlisted companies)? Whether Form MGT-14 is filed with the registrar along with the fees within 30 days from passing board resolution or special resolution? Whether the company has after passing Special resolution but before buy back of shares, has filed with the Registrar of Companies a letter of offer in Form No. SH-8? Whether the company has along with Form SH-8, filed with the Registrar of Companies & SEBI (for listed companies) a declaration of solvency in Form SH-9? Have you verified that Form Sh-9 needs to be signed by at least 2 directors; out of which at least one should be Managing director, if any in affidavit under rule 17(3)? Whether have you ensured that letter of offer is dispatched to the Shareholders or security holders within 20 days from its filing with Registrar of Companies? Whether have you checked that the offer of buy back has remained open for a period of minimum 15 days and maximum 30 days from the date of dispatch of letter of offer? If bought back shares are oversubscribed by the shareholders or security holders, whether the acceptance per shareholder is done on proportionate basis out of the total shares offered for being bought back, restricting it to the maximum number of shares to be bought back? Whether have you checked that verifications of shares bought back are completed from the date of closure of the offer of the offers received within 15 days? If the shares are to be rejected whether the communication for rejection of shares has been made within 21 days from the date of closure of offer? Has the company immediately after the closure of the offer, opened a bank account and deposited therein the total amount payable as consideration for the shares offered for buy back? Whether within 7 days from completion of verification of records, has the company made payment to shareholder? Whether within 7 days from completion of buy back, has the company extinguish and physically destroy the shares and securities so bought back from the shareholders? In case of unlisted companies buy back of shares, whether within 14 days, company has paid additional tax u/s 115QA @ 20% on distributed income? Has the company maintained a register of shares or other securities which have been bought-back in Form No. SH.10? Where is the register maintained & in how’s custody, who is making entries in that register, is these question in accordance with the provision of Section 68 or not? Has the company, after the completion of the buy-back, filed with the Registrar and with the Securities and Exchange Board of India (in case of a listed company), a return in the Form No. SH.11 within thirty days of completion of buy back? Is there annexed a certificate in Form No. SH- 15 to the return filed with the Registrar in Form No. SH-11? If the company has purchased its shares out of free reserves or securities premium account, a sum equal to the nominal value of the shares so purchased shall be transferred to the capital redemption reserve account? Whether the buy back is completed within one year from the date of passing board resolution or Special resolution? If there is a default by the company in any of the above mentioned points, whether the company has been informed about the penal provisions relating to buy back on company and every officer of the company?